the first selection of posts from the past, now online, to celebrate ten years of the Organists’ Blog. 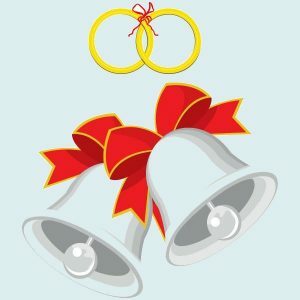 At the request of several readers, I’ve gone for the Bridal chit-chat anecdotes. There are 27 of these episodes and they can be found HERE. I hope you will enjoy dipping into them. Easter is late this year! As the Christmas season dies down, the church organist’s first thought is to scrabble through the new diary muttering ‘When is Easter? When is Easter?’ Having located Easter, the next calculation is ‘that means Ash Wednesday must be …’ This usually turns out to be sometime in February – and here we are, well into January, oh my gosh – so it’s a question of digging out the choir (sometimes literally, given January weather), persuading them away from their cosy firesides and into the freezing church for a bit of Lenten misery. 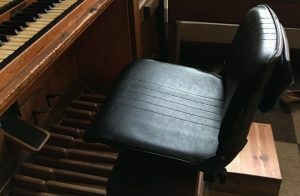 Update on last week’s attempt to return to the organ bench: it didn’t work. Back to the chair for another couple of months or so. Comments Off on Easter is late this year! Resolution No. 1: do something about the organ bench. The situation has been tough on our other organists. 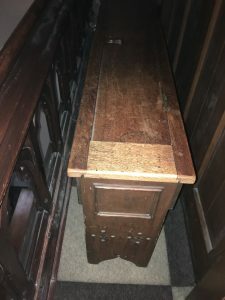 Their problem is not the chair, which they can pull out of the way quite easily, but the huge solid oak bench, the original one from 1874, which takes some muscle to heave into position. The 9 o’clock people then have to move it away again afterwards and put the chair back for me at 11.30. Actually, I think some of them just use the chair themselves, which they must find limiting, especially for pedalling. At Christmas, the gallery was full to bursting point with choir and instrumentalists. 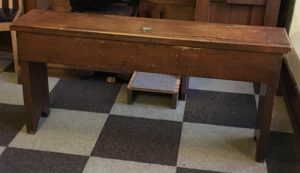 Our leader decided to move the bench out of the way completely, and had it carried round to the side of the organ, where it is now blocking the way to the humidifier tank and the hygrometer, so important at this time of year. So when I meet the cantor for practice, I’m going to ask him to help me get the monster back in position, and maybe, just maybe, I’ll try it out this Sunday. Resolution No. 2: do more practice. Resolution No. 3: take Resolution No. 2 seriously. Comments Off on Back to the bench? I have been taken to task over ‘welly’. It is not English, it is Scottish! Without thinking, I had been referring to the English language rather than to the country, but I still should have realised and acknowledged the innate Scottishness of ‘welly’. 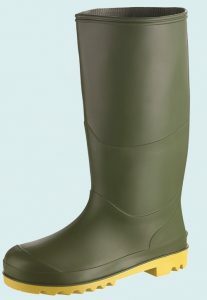 It is in Scotland that wellington boots are invariably referred to as ‘wellies’, in Scotland that there is a hostelry on the road to Oban called ‘The Green Welly’, and in Scotland that ‘give it some welly’ means’put your wellington-booted foot hard down on the tractor’s accelerator’. Apologies all round. First, a note for our foreign readers. ‘Give it some welly’ is a British English phrase deriving from farming and meaning ‘give it extra power’. Google it to learn more. ‘Give it some welly’ has been a common cry in our choir, and not only from the leaders. We all like welly, and have built a lot of it into our Christmas Eve programme. None so great, however, as in our experimental Sanctus. Trying to make the Christmas Mass Christmassy is always a problem in the world of Vatican II because (a) the people have to be able to sing the parts of the Mass, and therefore need to have some practice, but (b) Advent is a no-no for singing Christmassy Mass parts, and there’s no Gloria, anyway, and (c) as for people practising outside of Mass in the run-up to Christmas … well, pigs might fly. One answer is to use well-known tunes that make practice unnecessary. Our Christmas Carol Mass does that, as does Eugene Burns’s Christmas Gloria, which the choir are to sing this year. For the Sanctus, however, we’re trying out something rather different. The people know our Linlithgow Sanctus well; they sing it a lot during the year. But they haven’t met it in its new festive garb, with which we hope to shock them. The idea of decorating something familiar for Christmas so carried me away, that at the first choir practice I had to tell everyone to sing fortissimo because I would be playing all sorts of things but not the tune. ‘You mean we should give it welly’, said our American soprano, who seems to have taken to the phrase. ‘Yes, as much welly as possible, because I want to unleash all the organ’s welly, too. ‘Total welly …’, breathed one of the tenors, almost reverently. Everyone else murmured agreement. So on Christmas Eve we’re going to give the Sanctus everything. Even with a full church, I know how to make the floor shake. Some of the choir are worried about the stained-glass windows, although I think pitch would be more likely to do damage there than welly. This is going to be fun – I hope. Now let’s finish off with some welly from St Paul’s Cathedral, London. Happy Christmas, everyone! No, nothing to do with the Church of Scotland. I tried to send an email round the Forth in Praise mailing list, but couldn’t send it. After spending a day exchanging messages with the web hosting company, it turned out my email had gone into moderation, which meant that it was being held until approved by the website’s moderator, a sort of censor who has the power to release or reject it. But wait a minute! I thought. 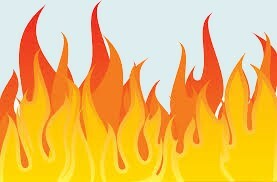 I’m the moderator. At least, I must be, as I’m the only person running this website. I struggled to make sense of this, and I suspected my remote helpers were struggling as well. I was directed to various parts of the operation, but nowhere could I find how to manage moderation of this mailing list, and release my email from the cage it was trapped in. I seemed quite powerless. Eventually, a way out was found by pretending I was an outsider with special privileges, and as such I sent the email. But not without discovering that my helpers had first sent a ‘test plz ignore’ email to my entire mailing list. So I felt obliged to send round yet another email to reassure people that Forth in Praise had not been hacked. I don’t know why, after years of happy mailing list sending, this problem suddenly came from nowhere. I still don’t know how to exercise my function as moderator in order to stop myself being moderated! The helpers finally gave up by referring me to a technical website which I couldn’t begin to understand. I can’t help wondering if the fact that my previously excellent web hosting company has recently been taken over has something to do with it. Oh, let’s have a carol.